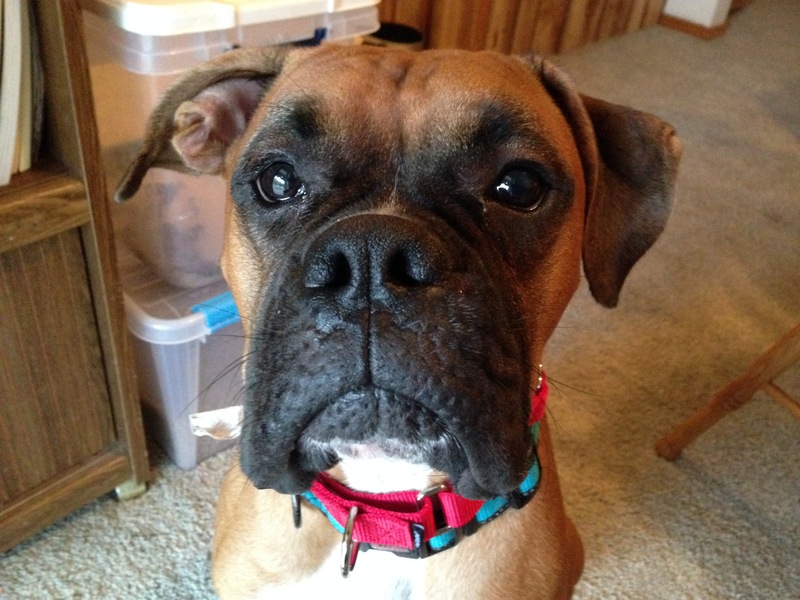 Baxter is a one-year-old Boxer who gets over excited often, especially when guests arrive; jumping up on them which scares the friends of the family’s nine-year-old daughter. It didn’t take long to see that a lack of constructive exercise along with few rules, boundaries, limits or limits had resulted in a dog doing as he pleased. His guardian said she didn’t walk him often because of how strong and excitedly reactive he was on walks. Later in the session, I showed her how to get him leashed up while remaining completely calm and fitted him up with a Martingale collar to help her have more control. As usual, the Martingale with the twist to the leash helped immensely. It was great to see the dog walking calmly in a heel next to his guardian. But before we were able to go out for a walk, we needed to communicate to Baxter that he needed to ramp his energy down. He was so excited, he had little control and squirted himself all over the room and the people inside of it. I was strictly observing for the first few moments to see how bad it got, but when Baxter literally climbed up on top of her I had seen enough. I had her get up to eliminate the lap space then when she sat down and he tried to climb back up, I used a hissing sound to disagree with him. Not only did Baxter not have any rules or limits he was supposed to respect, his guardians petted him so much that he got the idea that petting him was normal. To help start to redefine the leader follower dynamic I asked them to stop petting him temporarily. While its ok to pet a calm and balanced dog, petting a dog in an excited or unbalanced state actually reinforces what the dog is doing at the time. So when I have a client with this kind of dog, I advise them to Pet with a Purpose; asking the dog to sit or lay down and then petting them after they comply. This way the human is rewarding the dog for actions and behaviors they want. After these few corrections Baxter settled down quite a bit and started to keep a small but respectable distance from his primary guardian. We took this one step further by including the family’s nine-year-old daughter in the mix. Her guardian informed me that the dog often tried to jump up on her or take food that she was eating. Make a loud hissing sound as soon as, or before the dog breaks the rule or boundary. Stand up suddenly and turn to face the dog until it is stationary. Marching directly at the dog until it turns away, sits or lays down. Placing the dog on a leash and standing on it a few feet away from its head until it returns to a completely calm state. To test how well Baxter learned from my disagreement I had the girl get a hoho and sit on the floor right next to the dog. Baxter’s guardian and her daughter were shocked and amazed at how quickly their dog had changed its behavior. But that is one of the great things about dogs, they live in the now. I find that often its the humans who take the longest to stop bad habits (like petting the dog for jumping up on them). As we were discussing the change in Baxter’s behavior, his guardian mentioned that he only came when he felt like it so I showed them how to use a hand position and motion to get him to recall right away. Within a few minutes, Baxter was recalling like a champ. His guardian kept mentioning how well he did in training, but once he came home, his excited behavior returned. This is likely the case because the dog was in a strutted environment when in obedience class. But once he returned home, the lack of rules and structure made the dog think that was the top dog who could do as he pleased. A big part of this was the easy going laid back nature of his primary guardian. Usually a nice calm energy is the goal I try to stride for, but in this case it was too laid back for this particular dog. Even when I showed her non verbal communication cues, her movements were so slow that they didn’t have the proper impact on the dog. The guardian almost had a wind up before moving or correcting. A good example of this was when the guardian made the hissing sound to disagree. She would preface it with a “Oooh” sound then hiss a second or two later. Even after pointing this out to her she struggled to eliminate the pause and wind up. Fortunately Baxter’s guardian is determined and as a result of her efforts, her timing and technique improved as the session progressed. With some additional practice, she should be able to start responding and reacting much quicker. Because timing is such an important part of dog communication, the improvement of this skill will pay big dividends down the road. It was great seeing Baxter interacting with his guardians in a calmer, more respectful manner. Baxter isn’t a bad dog by any stretch of the imagination. He was simply being an exuberant puppy who wasn’t getting the guidance and leadership he needed from his guardian. Now that she knows how to lead and communicate with him in a way he understands, this new improved behavior will become his new normal.